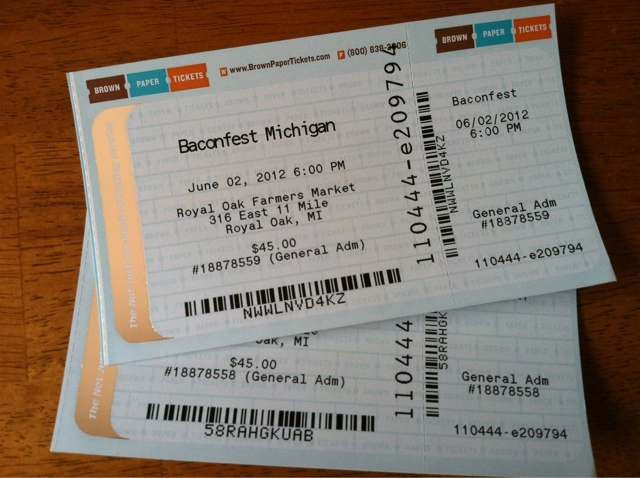 A few weeks ago I purchased tickets to Baconfest Michigan that will be taking place tonight at the Royal Oak Farmer's Market. I almost missed out on the opportunity because their Facebook page mentioned they were almost sold out. I think I was one of the last people to get my hands on a general admission ticket because one of my friends tried to buy tickets a couple hours later and she was out of luck. Thankfully I WAS able to score two tickets to tonight's event and will be ecstatically feasting on all sorts of porky goodness. It's no secret that I am a bacon fiend. My students know this. My family knows this. Even my friends on Facebook whom I haven't seen in years know this. Bacon & grit cake topped with thick-cut smokey maple & black pepper bacon in bacon-scented redeye gravy. Hope you have a wonderful time at Baconfest. Happy Bacon Fest!!! I can't wait to read your post. Take lots of photos!! Have a great time. When you are back you might have some ideas for Food on Friday: Bacon on Carole's Chatter. Hmm... that's a LOT of bacon. This sounds like a lot of fun. I like bacon, but not that much, though I have a 9 year old niece that would be in seventh heaven at a baconfest. Enjoy! this sounds seriously amazing. can we please get pics? Oh yeah -- sounds like a super festival ... where do I sign up. LOL.